Will you look at this child! She's already over 6 pounds. I'm having trouble with way too much amniotic fluid so I look like a whale and feel really miserable. We still have about four weeks to go. 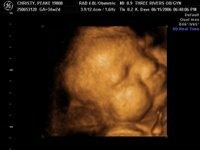 I can't belive those chubby cheeks - maybe she's storing up for the winter?? The boys are so excited. They can sense the time is winding down; probably becasue I can't bend over and pick up anything at all. Caleb just got the laundry out of the dryer for me, "so you won't hurt baby Lacey." My bestest friend is giving me a baby shower tonight, I'm very excited. This is my last little baby so I'm trying to savor all the fun stuff. I cant wait to see those chubby cheeks. Not long now! !